This fast term program has now payment problems, do not invest. Possible scam alert. Payments are processed manually and are accepted from PerfectMoney and Payeer only as of now. It is expected to add more payment systems to the program soon when they add new layout with the expected upgrade. Deposits are recorded instantly though. Program website is hosted on KODDOS, it is running on licenced Gold Coders script, program layout is basic with custom design. SSL connection active: PositiveSSL valid from 24 Jan, 2019 to 25 Jan, 2020 – Sectigo Limited. Your investment principal ($50) and earnings are locked for 24 hours and after maturity you will gain back $50.75 following $0.75 net profit which is included. With included principal you have earned back $50.75 (101.5%). Your investment principal ($100) and earnings are locked for 5 days and after maturity you will gain back $110 following $10 net profit which is included. With included principal you have earned back $110 (110%). Feb 19, 2019: Finished round #1 with a result of 110% following 5 USD profit. 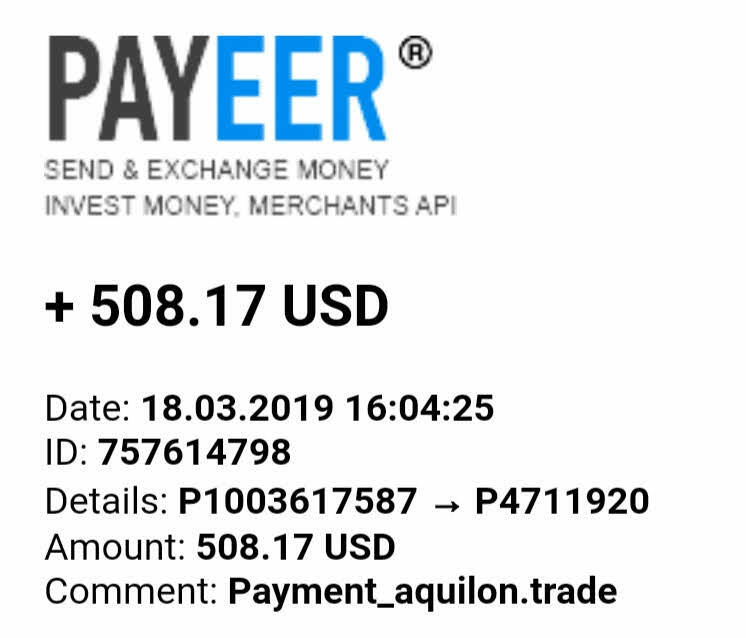 Feb 14, 2019: Joined with 50 USD deposit. Program have operated for long time, but recently the payments processing has been switched off. It is now a problem, will update soon. Do not add any investment now. Payments are accepted from both USD and crypto currencies, but the currency dedicated in the program is in USD value. Available payment options are PerfectMoney, Payeer, Bitcoin, Ethereum, Bitcoin Cash, AdvCash, Qiwi and Visa. All operations including withdrawals are processed instantly from program. The affiliate system is designed two levels which will provide 30% of referral daily earnings (bounty) and 10% from second level for the upline, to the account balance which can be withdrawn or buying tokens (invest). This bounty is not deducted from anyone’s earnings, it is paid from the program funds. Program website is hosted on Reg.Ru, it is running on unique and advanced script, program layout design is unique. SSL connection active and paid for two years: RapidSSL RSA CA 2018 valid from 21 Aug, 2018 to 02 Jun, 2020 – DigiCert Inc.
You would receive $0.25 to $0.50 daily to your account balance on every calendar day. These earnings can be withdrawn at any time. When you decide to withdraw principal after one month, then it’s value is grown approximately 11%, selling tokens price is 7% cheaper then buying then your principal value from $50 is now $52. Total: $2 + $0.35 * 30 = $12.50 net profit. With returned principal you have earned back $62.50 (125%). You would receive $1 to $2 daily to your account balance on every calendar day. These earnings can be withdrawn at any time. When you decide to withdraw principal after two months, then it’s value is grown approximately 22%, selling tokens price is 7% cheaper then buying then your principal value from $200 is now $230. Total: $30 + $1.50 * 60 = $120 net profit. With returned principal you have earned back $320 (160%). Mar 6, 2019: Released 50 USD from deposit principal. Feb 9, 2019: Joined with 100 USD deposit.